Forget all those two-headed, inbred jokes. Tasmania is funny for a whole new reason, producing some of the best young comics around. Over the past few years the Tasmanian comedy scene has been quietly brewing a new batch of comedians. Drawn from the purest comic sources and unique in flavour, these comedians are now ready to unleash their sparkling, rich and refined comedy onto a mainland audience. 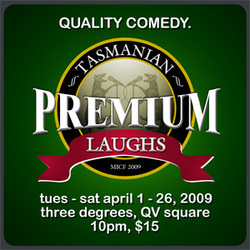 Premium Laughs is a showcase of Tassie's best and funniest new talent including Raw Comedy national finalists Luke McGregor and Matt Burton, plus John 'Cambo' Campbell, Tracey Cosgrove and Mick Davies. Hand picked and produced by Gavin Baskerville (2005 Moosehead Award Recipient), this is a fine brew of unique comedy styles, blended and served up for your pleasure at Three Degrees. Grab a beer from the bar and enjoy the show. This is premium laughs at a bargain price. Only $15. 10pm Tues - Sat April 1- 26. Three Degrees, QV Square, Melbourne. All tickets $15. “Hobart has become an amazing breeding ground for new comic talent” The Mercury. The room at Three Degrees is a tough place for a comedian. It’s not the crowd, who were primed to laugh, but the space itself. Stuck at the back of the venue, the room is awfully lit with only a single spotlight trained on the stage – a look that suggests police line-up rather than stand-up. With four of Tasmania’s best and brightest comics waiting in the wings ready to take to the poorly lit stage, I hoped they were up to the challenge. They were. Thanks to a well thought-out line-up, the comics’ unique styles ensured a variety of laughs. First on was Mick Davies, a self-assured lad with a tight set of observational jokes. John ‘Cambo’ Campbell followed and was the standout performer, a case study in straight-faced, deadpan one-liners. Matt Burton was the storyteller of the evening and his enthusiastic routine built to a warm and rewarding conclusion. Luke McGregor was last on and he really was an interesting comedian. Working a nervous shtick as his onstage persona, his material was fresh and original. He took offbeat or under-examined ideas all the way through to his own logically twisted conclusion – what would it be like if make-up were a new invention? There is a lot of promise in these four boys. They had good solid gags, and plenty of swagger on stage. Tasmania will have a lot more to be proud of than Boag’s beer and David Boon if they fulfil their comic potential.